This example illustrates how a book might be entered as a source. See the introduction for notes that apply to all three of these examples. [AUTHOR], [ITAL:][TITLE][:ITAL] ([PUBLISHER ADDRESS]: [PUBLISHER], [PUBLISH DATE])<, [CD]><. Hereinafter cited as [ITAL:][SHORT TITLE][:ITAL]>. [AUTHOR], [ITAL:][SHORT TITLE][:ITAL]<, CD]>. [AUTHOR]. [ITAL:][TITLE][:ITAL]. [PUBLISHER ADDRESS]: [PUBLISHER]<, [PUBLISH DATE]>. Daniel F. Littlefield, Africans and Creeks from the Colonial Period to the Civil War (Westport, Connecticut: Greenwood Press, 1979), 79-80. Hereinafter cited as Africans and Creeks. Littlefield, Africans and Creeks, 79-80. Littlefield, Daniel F.. Africans and Creeks from the Colonial Period to the Civil War. Westport, Connecticut: Greenwood Press, 1979. Many standard Source Types in TMG include the "Hereinafter cited as..." phrase, which is not included in the examples in Evidence! Many users (including me) think that is unnecessary unless the short title is very different than the full title, and they remove that phrase from the Source Type templates. 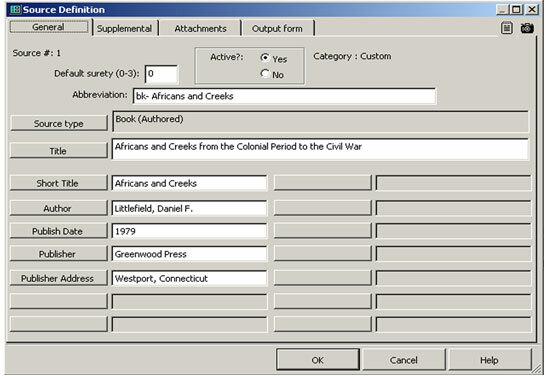 Since this is example is for a published book, which doesn't usually require a Repository, all the data needed to define the source could be entered on the General tab of the Source Definition screen, as shown in the screenshot. I omitted the "Jr." from the author's name because TMG's feature that automatically rearranges the parts of the name for the various note formats doesn't deal with suffixes very well. If it is important to you to include them, perhaps the best method is to type them directly into the Output Templates of the Source Definition. TMG produces a double period after the author's name in the Bibliography output in this case, because of the period after his middle initial. This can be resolved either by omitting the period when entering the name, of by removing the period from the Output Template for the Bibliography in the Source Definition.